One purpose of the Full Cheek is to prevent the bit from sliding through the mouth. They also help lateral action by pressing against the horse's cheek. Full Cheek bits are a fixed cheek bit. This may be useful for horses that are unsure of the bit because it doesn’t move around too much in the mouth. 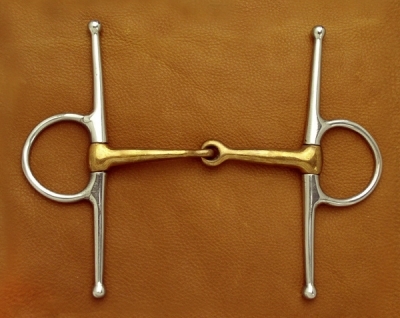 Full Cheek bits are very useful for breaking in, or the bringing on of young horses, as it helps with turning. When teaching the horse to turn the full cheek bit does not slide through the mouth as other, smaller style cheek snaffles would. The Full Cheek also encourages the horse to stretch into the contact. The bit is particularly useful for horses that nap or suddenly makes a dash for the gate or for the nosey horses who spends half their time looking at what they are missing in the paddock. Because a fixed bit snaffle mouth would be less suitable if your horse is prone to leaning or taking hold of the bit we offer a Full Cheek Waterford mouth instead of the snaffle mouth that deals with this problem while allowing the benefits of the Full Cheek. The Full Cheek bit can be used with or without fulmer loops/keepers. Many riders say that they use the keepers to keep the bit in the correct place, and because they add poll pressure. If you don’t need additional poll pressure then, it probably wouldn’t be useful to use the keepers. Shanks are 2" from the center, both up and down. 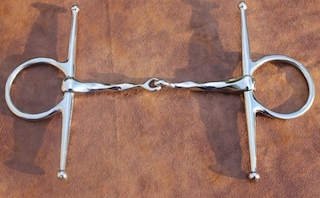 This stainless steel Full Cheek Slow Twist Snaffle is a bit that applies pressure on the cheek to aid in steering. The Slow Twist mouth helps keep the horses attention. 8" Cheek piece with a centered 2 1/2" ring Sizes: 5 3/4 ", 6", 6 1/2"
Size: 5", 5 1/4", 5 1/2", 5 3/4", 6", 6 1/2", 7"